There are three bees on the university crest, but we don't really have a mascot. Four faculty, three postdocs and six Ph.D. students currently work on Fermilab experiments. 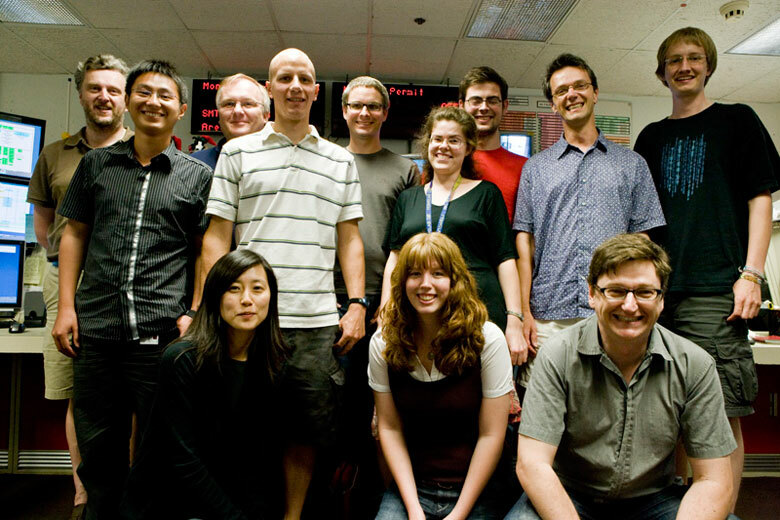 Two of the faculty, all the postdocs and three of the Ph.D. students are based at Fermilab. During the summer two undergraduate students also work at the laboratory. DZero trigger development and data quality monitoring; calorimeter calibration and lepton identification; convener of Higgs, top and electroweak physics groups; physics coordinator, institutional board chair and two Dzero spokespersons. On CDF, charged Higgs searches and convener of top mass group. Hugh Montgomery, former associate director for research at Fermilab, studied as an undergraduate and graduate student at Manchester. We have a wide spectrum of research interests: Higgs searches and electroweak physics on DZero, top physics on CDF, DZero and ATLAS; forward physics and searches on ATLAS; tau and B physics on BaBar and neutrinoless double beta decay on NEMO. We have a strong hardware group, specializing in 3-D silicon and we are part of the Cockcroft Institute with several accelerator physicists. Our theorists work on a wide range of subjects from quantum chromodynamics to supersymmetry and neutrino physics. WHAT SETS PARTICLE PHYSICS AT MANCHESTER UNIVERSITY APART? We are one of the largest particle physics groups in the UK with more than 100 members. Theorists, experimentalists and accelerator physicists collaborate very closely in our group, for example by jointly supervising Ph.D. projects. Particle physics in Manchester has a long tradition: Exactly 100 years ago, in 1909, Geiger, Marsden and Rutherford discovered the nucleus at the University of Manchester in the gold foil experiment. Front row from left: Maiko Takahashi, Clara Nellist and Christian Schwanenberger. 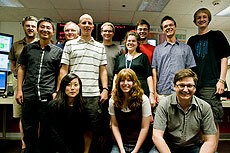 Back row from left: Graham Wilson (now with the University of Kansas), Pengfei Ding, Stefan Soldner-Rembold, Mika Vesterinen, Krisztian Peters,Yvonne Peters, Luke Thompson, Terry Wyatt and Tim Head. Not pictured: Phil Rich, Louise Suter, Tammy Yang, Mark Owen and Un-ki Yang.